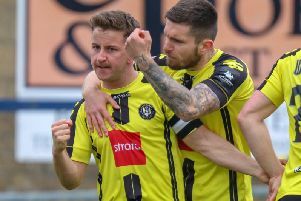 Harrogate Town held on to secure a valuable Vanarama North win against Gloucester City. A second-half Jordan Thewlis brace was enough to wrap up the points for Simon Weaver’s men, despite a late Gloucester onslaught - and goal. Paddy McLaughlin made an assured debut for Town, but the first half was a torrid affair, with Gloucester on top but unable to make their pressure count. Town were restricted to bursts forward by a lively Jack Emmett and inventive Cecil Nyoni. At least the sun was shining for the 444 inside the CNG Stadium. Both sides improved after the break, with the introduction of Adam Nowakowski for Leigh Franks seemingly giving Town more attacking freedom. And, within ten minutes of the restart, the home side were in front. Louie Swain played the ball for Thewlis, who smashed home. Backed by a vociferous home support camped in the new hospital end stand for the second half, Town took control. Fans revealed a banner which read ‘get well soon Gazza’, in reference to the watching Town midfielder Andy Gascoigne, who is facing months out of the game after breaking his leg following a tackle in Town’s home win over Chorley in February. With the home side calling the shots, Thewlis made it 2-0 after shrugging off the Gloucester defence after 64 minutes. However, the rest of the match was largely played in Town’s half, as Gloucester surged forward. The pressure told after 74 minutes, when Sahr Kabba headed in for 2-1. Town were able to hold on for an important three points, lifting them 11 points clear of Gloucester and they now sit 10 points below the final play-off spot, currently occupied by Guiseley. Town travel to basement side Hyde FC next Saturday, March 14 (kick-off 3pm). Town: Crook, Fallowfield, Swain, Franks (Nowakowski, 45), Turner, Bloomer, Nyoni, McLaughlin, Clayton, Thewlis (Speight, 75), Emmett.